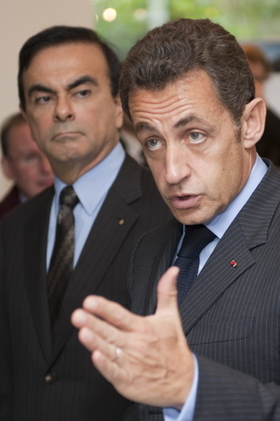 French President Sarkozy, right, has summoned Renault CEO Ghosn, left, to a meeting. PARIS (Reuters) – The French government fired back at EU regulators on Friday, saying it was justified in asking Renault to scrap its plans to move Clio car production to Turkey because the automaker agreed last year to save jobs in return for state aid. The EU competition watchdog is demanding an explanation for France's opposition to the transfer and seeking assurances that state help to the industry will not affect companies' ability to act freely. France's EU affairs minister Pierre Lellouche on Friday said a state-sponsored deal with carmakers met EU laws and was approved by the EU Competition Commission. In February 2009, as a condition of a government aid package during the economic crisis, Renault pledged not to close factories in France for the duration of a 3 billion euro ($4.37 billion) low-interest loan. "Nothing in the commitments we made forbids the state shareholder to discuss Renault's strategy with management and to express its wish of seeing a car for the European market produced in the European Union," Lellouche said. French President Nicolas Sarkozy has summoned Renault boss Carlos Ghosn to a meeting on Saturday to discuss plans to move the production of its new Clio car to its Bursa factory in Turkey when the fourth-generation of the subcompact is launched in 2013. Currently, the Clio is produced in Flins, near Paris, and in Spain, Slovenia and Turkey. Renault may also halt Clio production in Spain and Slovenia, media reports have said. The French government owns 15 percent in Renault and Industry Minister Christian Estrosi has said it could increase that to as much as 20 percent to give a stronger voice in the carmaker's affairs. Lellouche said Renault had pledged to do all it could to prevent job losses and a code of good practice, which bound French carmakers, excluded the closure of any plant in France. Budget Minister Eric Woerth said France was not planning yet to increase its holding in Renault but would do it if it had to. "If we have to do it, we will... Considering we help this company (Renault) -- we put a lot of money in the car industry -- it would seem to me paradoxical to invest elsewhere," Woerth said. Earlier this week, French president Nicolas Sarkozy said: "We are not putting a lot of money on the table to help our carmakers in order to see all factories go abroad." Renault may move all Clio production to low-cost Turkey. Renault says "several scenarios" for the Clio are being looked at but the company needed to ensure that it was manufactured as economically as possible. Renault director Jerome Stoll told reporters on Thursday that a compromise was possible in the dispute. "We are in the middle of a decision-making process which should allow us to reach a solution that everyone will find acceptable," Stoll said. 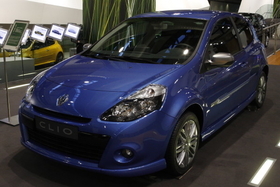 The Clio was the third-best selling car in France in 2009, after the Peugeot 207 and the Renault Megane.